This Stinks! Seven Years for Stealing Cheese? SACRAMENTO (CBS/AP) Robert Ferguson will have to put his unsuccessful career as a thief on hold, as he's been sentenced to seven years and eight months behind bars for stealing a package of cheese, according to the Sacramento Bee. On Jan. 6, Ferguson was convicted of two counts of (extremely) petty theft for stealing a woman's wallet from in a 7-Eleven and for stuffing a bag of shredded cheese worth $3.99 into his pants at Woodland's Nugget Market, said The Sacramento Bee. A Yolo County judge, Thomas Warriner decided Monday that despite Ferguson's 13 prior convictions and his having spent 22 of the past 27 years behind bars, the man had still not learned that stealing was against the law. Prosecutors originally tried to get him a life sentence under the state's "three strikes" law, said the Bee. The Deputy District Attorney Clinton Parish told the judge that Ferguson was a career criminal who wouldn't change. The Bee said that his defense lawyer argued Ferguson was bipolar and had trouble controlling his impulses to steal during manic phases. Jail seems to be an easy solution to help him control those impulses. 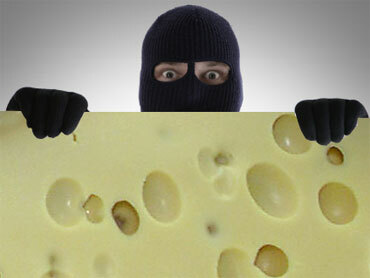 "We're talking about a pack of cheese," his defense lawyer said. The master criminal will be eligible for parole in less than three years, said the paper.